​It had been a full week since Stephen A. Smith made an obnoxious showing on national television. At least we could laugh at his ​horrendous pre-game analysis of the Chiefs and Chargers. His most recent incident is less funny...it just feels ignorant and disrespectful. Smith had absolutely no sympathy for Patriots receiver Josh Gordon, after the ​NFL suspended him again for substance abuse. The ​suspension came in the wake of Gordon announcing that he was ​stepping away from professional football to focus on his mental health. Substance abuse is one of the most common manifestations of mental illness, especially with the kind of access to drugs that professional football players have. In a sport where getting hit and living with pain is all part of the job, it's far from unheard of for teams to pump athletes with opiates just to get them back on the field. Smith discussed the topic further on his After Dark Podcast, although I don't know how much more anyone really wants to hear, save for an apology. 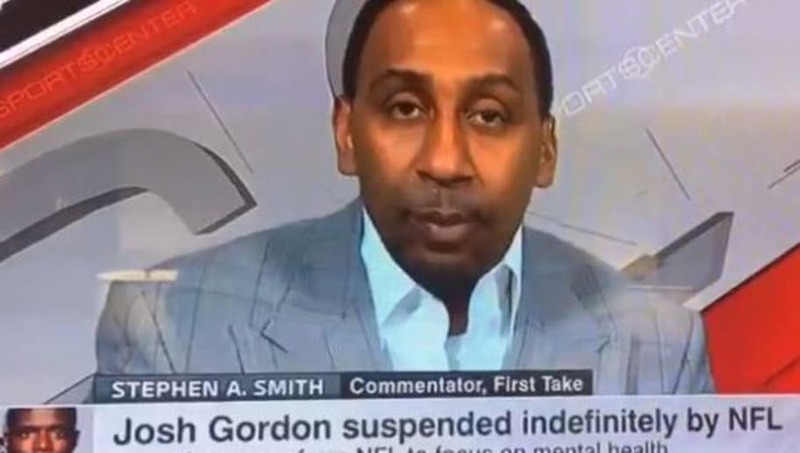 With Josh Gordon being suspended yet again by the league Stephen A. wonders if people will be willing to give Gordon another opportunity to play in the league. Smith has a lot to learn about mental health and the struggles that come with it.